Distance: 7.9 kilometers with about 100 meters elevation gain (4.9 miles with perhaps 350 feet of elevation gain). We opted for a short day today since we all still felt like burnt toast from yesterday's heat. Yes, I know, that sounds pathetic to Spaniards and southerners...but we're snowbunnies and anything over 70 degrees is just too dang hot for hiking. We would never survive El Camino in verano. We operate best in the cool and the cold. The sun came out bright and early as we left Cacabelos. We soon stripped to our short-sleeves and broke out the sunblock. The Camino splits after Pieros. One can walk along the road all the way to Villafranca or one can take the slightly longer, scenic country route. You can probably guess which way we traveled. The country route provided cool breezes, intermittent shade, and natural beauty. I highly recommend going this route (yellow path in the Brierley guidebook). 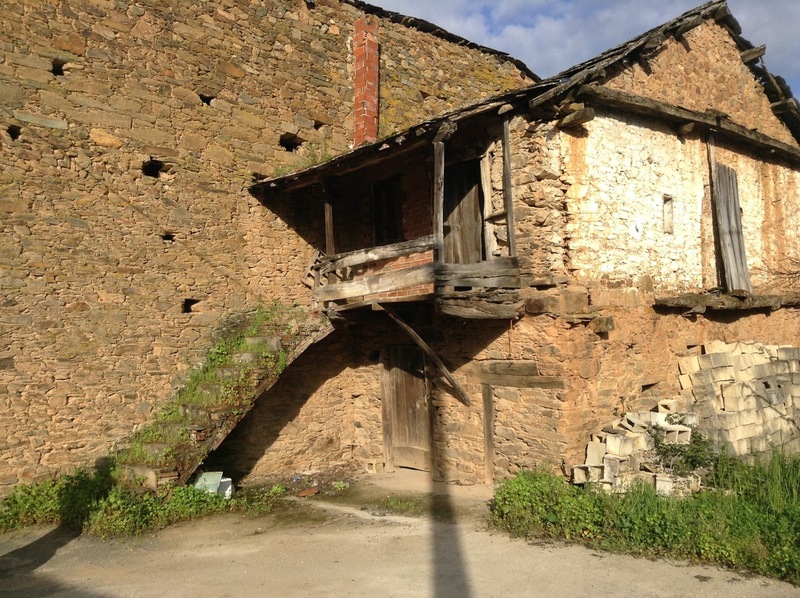 This route leads the pilgrim through the small and charming village of Valtuille de Arriba. Since Hugh and I regretted not staying at the Parador in Leon, we wanted to check out the prices for the Parador in Villafranca. This is the last Parador on The Way until we get to Santiago. We therefore walked past the albergues and past the Castillo Palacio de Los Marqueses, and past a man and a woman leading two donkeys...they had three small children with them and they were heading from Santiago into the middle of France...we thought we had stumbled into a different century for a moment...very cool and I wish I had asked their permission to take a photo. We walked past an intersection and turned to the left, to the Parador. Cost for a triple - sixty Euros. Our room is huge and gorgeous. Here's a strong piece of advice - don't assume you can't afford a private room at a nice hotel. Many hotels, including Paradors, have discount prices certain times of the year and many offer great deals to peregrinos. There's no reason a solitary pilgrim can't team up with two others and splurge on this kind of room (only twenty Euros a person...it's a four star hotel with a pool). 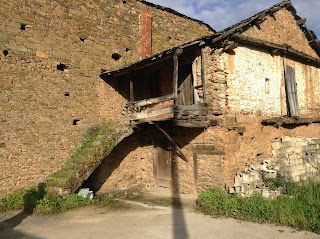 So always ask when you're curious about the nice hotels you see along the Camino. Yes, albergues are great and we will definitely use them for most of the remainder of our trip, but you deserve the occasional break from the crowds and the snorers. We checked in, cleaned up, and sat in the Plaza Mayor for three hours (eating, of course). Tomorrow we begin the climb to O'Cebreiro. The distance from here to there is 18.7 miles and there's a typical White Mountain's worth of elevation gain. We'll probably break up the trek into two days and stop in Herrerias or La Faba tomorrow afternoon and then go past O'Cebreiro to Fonfria the next day. Thanks again for all the kind emails and the nice comments on my blog, Facebook page, and Trail Journals Guest Book, folks. The well-wishes mean a lot to me and the girls. I think I've answered everyone's questions to date, but if I've made a mistake and overlooked a message, then please post your question/comment again. Hello Trish, Hugh and girls. I´m Ildefonso again. I write this post to encourage you for take longer distances. Probably the heat become much higger the next days. In two or three weeks you´ll probably find temperatures about 80 to 85 Fharenheith degrees. Rosa and me hope you have Buen Camino. ¡ULTREIA ET SUSEIA! We did Villafranca to Vega del Valcarce.....and it was such a good place to stop (the albergue up a steep little hill on the right)...the lady made chocolate spread on bread for all the kids....just because. (that was a 17.5km day and not at all difficult...then the next day we went to O-Cebreiro - 13km - where our 8yo fell over! She walked the following day to Triacastela - 21km before we realised her arm was probably broken and went for medical help!) The first hour or so AFTER O'Cebreiro is (in my opinion) harder than the climb up to O'Cebreiro, so consider that if it is late and hot when you get to the tourist town! I just discovered your blog, your journey and your book. I am so moved by what you are doing. I also feel connected to you in several ways. My husband is spending 10 days on The Camino this coming June. He will start in Portugal and end in Spain. Reading about your journey makes me so excited for him and all he will encounter. Also, I love to hike with my 4 little ones. They are 8, 6, 4 and nearly 2. Last weekend we just did their longest hike yet, almost 6 miles. I don't know the elevation gain--maybe 800 ft? I understand to your little hikers that is a short jaunt, but we're just beginning to build up their hiking legs and work toward longer hikes. I watched the trailer for your book last night and was moved to tears at the experience you are offering your girls. It's amazing, beautiful and so inspiring. I'm very excited to read your book. And you have fueled my fire to hike the Camino with my whole family as soon as I don't have to carry the littlest on my back. Happy trails to you as you finish your journey! I dont think you answered mine....are your plans to hit the cast? Counting the days till I am out on trail again with my sons, enjoying your travels. I can't tell you how much your blog and pictures mean to me. Every day, I hunger to see what you have posted. Thank you so much for taking the time to write this blog. Hi Ildefonso, soon we will be in the mountains and the cooler temps. :). We average 12 or 13 miles a day, which is what we can comfortably do. 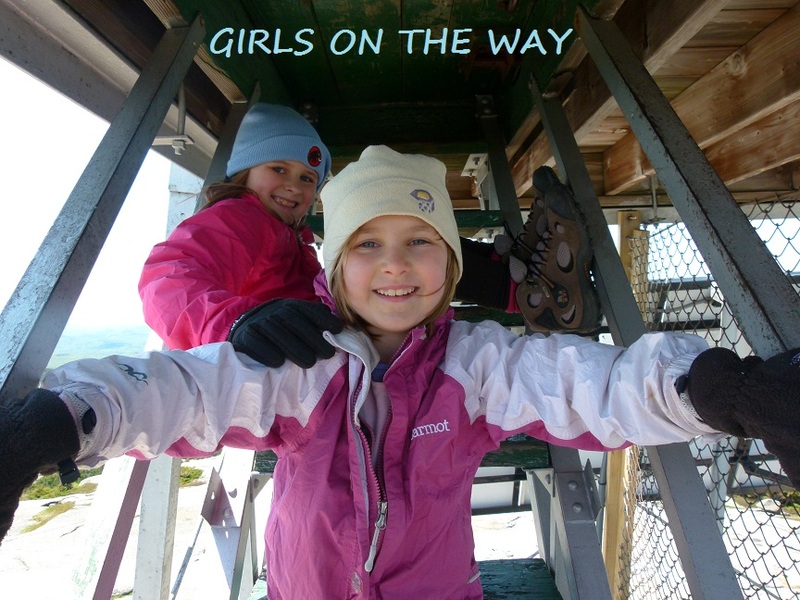 I can't push the girls to go past their comfort zones. We should be finished the Camino by April 24, so hopefully it won't get too hot before then. If it does, then we'll pour water over our heads as we hike. :). Hope you and Rosa are well. Rachael, that sounds like quite an adventure! We will keep what you wrote in mind - thank you! Greta and Julie, that's a lot of kind praise, and I thank you. Anonymous, I'm not yet sure about the coast. Will depend on what the girls want to do once we reach Santiago. Could you do a blog post on how the girls are doing in general? What is their attitude? Their health? Do they like all this walking or do they complain? Any helpful advice to parents considering the Camino with children or teens? I'm really enjoying your blog! Ultreia! Hi Annie, my kids have been hiking since the ages of four and five. They hike mountains in all seasons in New Hampshire. They love to hike (and therefore they never complain). We got into serious hiking because of my oldest daughter's prodigious hiking ability when she was five years old. I have never - not once - heard either one of my kids whine or complain when they hike...I can't even imagine that. If they did ever start to complain, then we'd do something else they'd rather do. I'm trying to give you a picture so you understand when I say that I cannot give advice when it comes to taking other kids on the Camino. Well, I suppose I can...if your kids don't already love to hike and aren't already serious hikers, then hike with them at home first to see how they do and what they like in terms of distance. Perhaps you could try taking them on small sections of the Camino and plan on stopping for the night every ten of twelve kilometers (unless they want to go farther, and then go for it). Keep it light and simple for them and if they hate it, then stop. If they don't already like to hike at home, then taking them on the Camino might prove risky in terms of expense and expectations. Hope this helps somewhat. Alex and Sage both agree with the above. They are both happy, loving the Camino, and completely healthy. Alex's blister has healed and Sage's is finally going away. As I've written before, both girls feel good going about 12-14 miles per day and they're eating like crazy (as am I). They love the scenery, Alex loves talking with the locals in Spanish, and neither is in any hurry to return home. Both are thinking that they want to continue to Finisterre after we reach Santiago. Very inspiring lines !! Very nice memories for your children and example for many parents and kids. great inspiration for my own short camino starting june 5!